We’ve examined Google Analytics data from 181 websites from 2015 to 2016 in order to establish industry benchmarks across a wide swath of web analytics metrics. The outcome of our exercise produced some very intriguing results that will help content marketers determine how well they match up to the market. 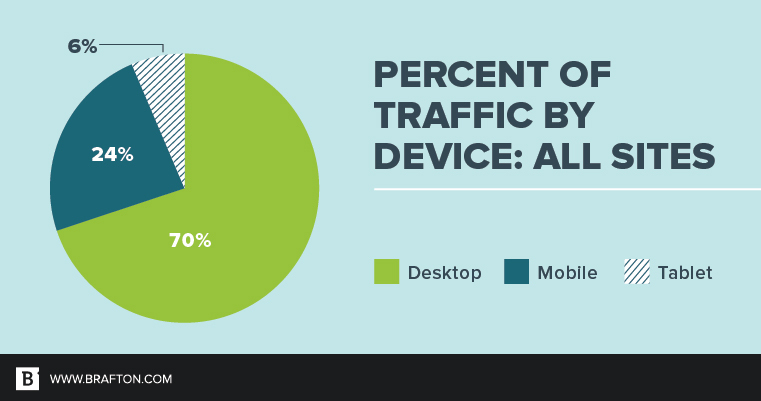 Mobile vs. desktop vs. tablet traffic. 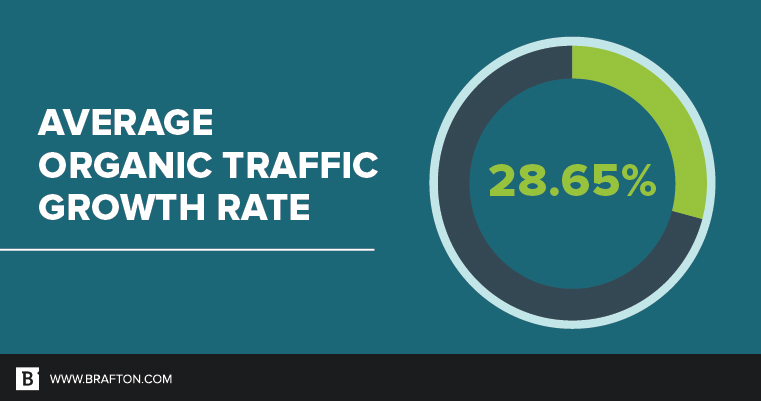 Percentage of traffic driven by homepage. Blog bounce rates and average session duration. Long gone are the days of web browsers competing for market share. Google Chrome is dominating the market, being the choice browser for traffic in 91 percent of websites surveyed. The closest competitor is Safari, at 5 percent. Interestingly, each of the nine sites with the majority of traffic driven by Safari were B2C businesses, accounting for 16 percent of all B2C sites surveyed. Keep this trend in mind if you are a B2C company, as you will need to be mobile optimized, specifically for Safari. Setting up site conversion goals is imperative for quantifying the impact of your content marketing program. Measuring the ROI of your website and making smart decisions would be near impossible without doing so. 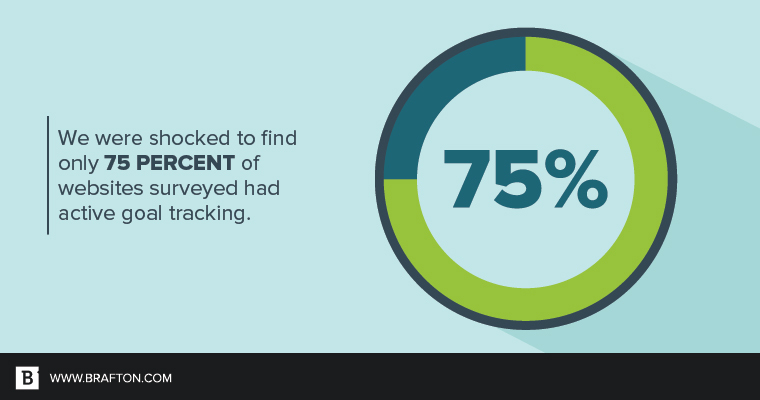 We were shocked to find only 75 percent of websites surveyed had active goal tracking. B2B and B2C businesses set up goals at nearly identical rates, with B2B using goals 74 percent of the time versus 75 percent for B2C. Bounce rates are carefully observed by webmasters as a key indicator of visitors having a positive and productive experience on their site. A high bounce rate is indicative of a poorly performing page (or site), either from a content or user experience perspective. The websites surveyed had an average bounce rate of 58.18 percent. B2B sites had a higher average bounce rate than B2C sites; 61.04 percent versus 54.24 percent, respectively. 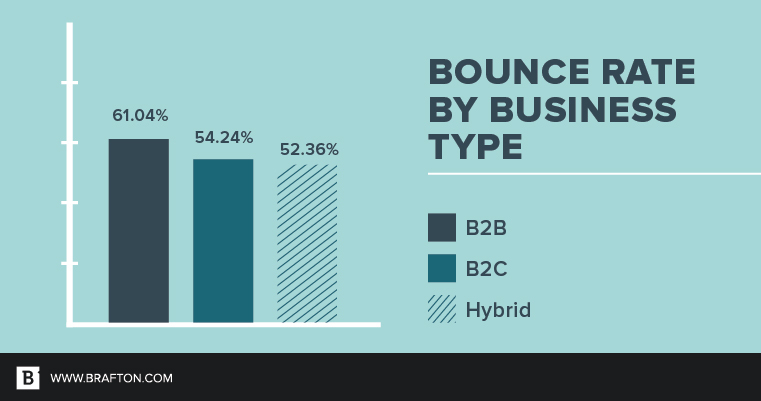 Hybrid sites that provide both B2C and B2B offerings had the best performance with an average bounce rate of 52.36 percent. 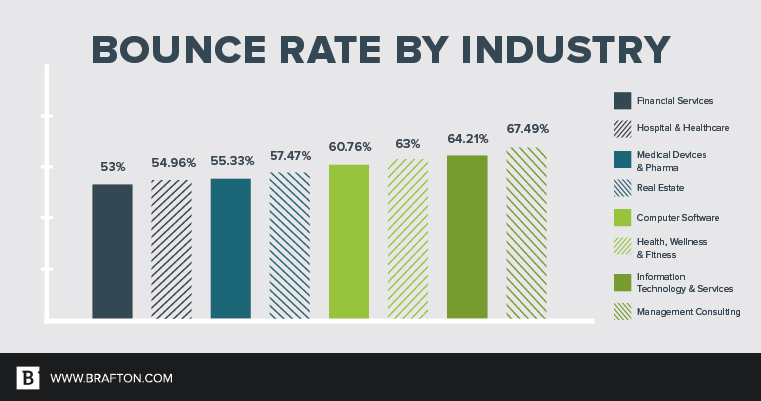 Looking across the top industries surveyed, we observed websites in the financial services industry leading the pack with the lowest bounce rate of 53 percent. Management consulting lagged the most at 67.5 percent. 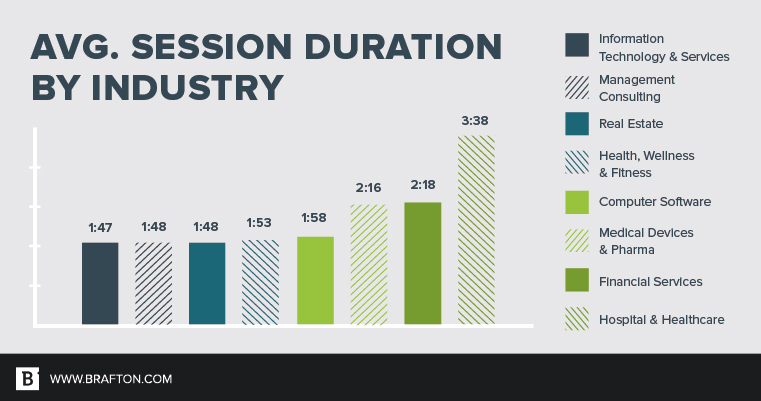 Average time on site tells you the average duration of all visitor sessions during a given time period. This metric is an indicator of visitor engagement with the content you provide; one can make the assumption that the longer a visitor stays on the site, the more they consume content and invest mindshare in your brand. 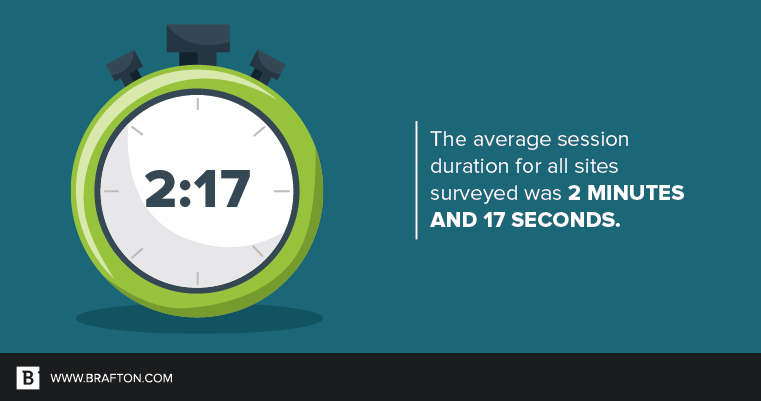 The average session duration for all sites surveyed was 2 minutes and 17 seconds. B2C companies set themselves apart from their B2B counterparts with visitors spending an average of 42.3 percent more time on site. Of most of the major industries surveyed, visitors averaged just under 2 minutes on site. 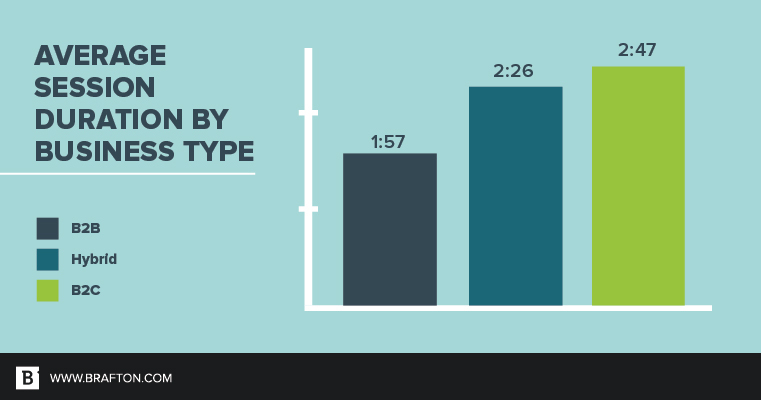 Hospital and healthcare websites stand out significantly from the pack, averaging 3 minutes and 38 seconds on site. 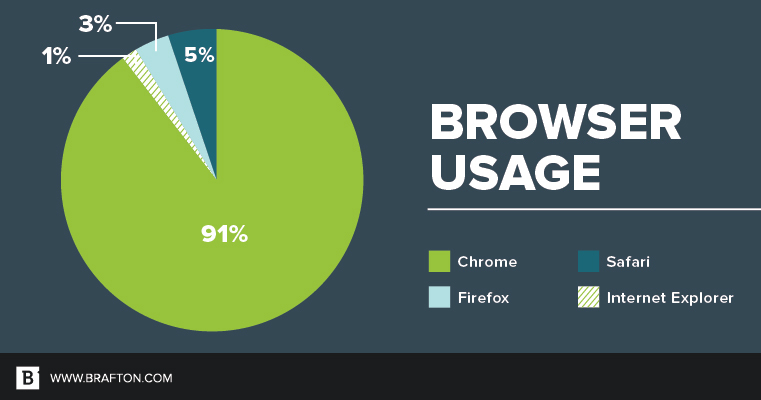 Understanding what devices your audience is using to browse your website is critical. Ideally your site will be fully optimized for both mobile and desktop experiences, however, some sites may need to prioritize mobile experience more than others. Our survey showed 70 percent of all traffic came from a desktop device, 24 percent from mobile and 6 percent from a tablet. If we group phones and tablets together as “mobile,” 3 out of every 10 visits came from a mobile device. Comparing B2B and B2C businesses, we see a drastic difference in behavior. B2B showed 78 percent of traffic coming from desktop devices, compared to 18 percent for mobile and 4 percent for tablets. B2C sites showed only 55 percent of traffic arriving via desktop, and 45 percent via phone or tablet. The key takeaway here is your site should absolutely be mobile-friendly, but it’s a must for B2C businesses. It was our intention to establish benchmarks for what percentage of traffic any given B2B or B2C website should be driving via social media efforts. 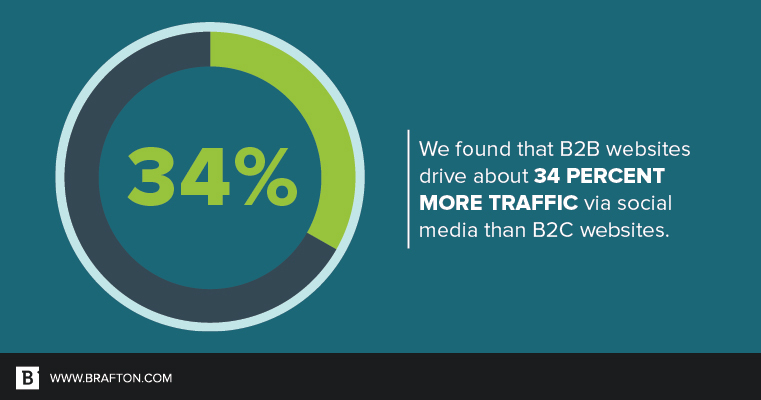 Shockingly, we found that B2B websites drive about 34 percent more traffic via social media than B2C websites. By analyzing the percentage of traffic driven by the homepage, you can get a general sense of how well a business is leveraging content marketing efforts. If a site is heavily reliant on the homepage to drive the majority of its traffic, you can make the logical assumption the site is not driving proportionate traffic via its core landing pages and blog. This means the site is missing out on ranking for factors of keyword combinations the homepage alone cannot rank for. In short, a higher metric indicates an overleveraged homepage and poorly performing landing pages and blog. A lower metric indicates a strong content marketing program that is driving traffic via keywords from ranking landing pages and blogs. B2C websites generate 46.6 percent more traffic via non-homepage content. B2B websites do not generate as much traffic via strong content marketing programs as B2C websites. This is partially due to the fact that B2C websites tend to have more product pages than their B2B counterparts. From 2015 to 2016, 152 of the websites surveyed showed an average organic traffic growth rate of 28.7 percent. With generally increasing search activity and massive amounts of content being added to the web every day, this does not take us by surprise. People tend to have lofty expectations for their blog and are often surprised when less-than-stellar data is presented to them. It’s common for clients to expect blogs to decrease a site’s overall bounce rate and increase the average time on site when more commonly, it’s the opposite that holds true. This is not necessarily a bad thing when you consider the purpose of a blog and the intention of the visitors consuming its content. These visitors are very top of the funnel, often consuming content then leaving immediately after. This is fine. You want visitors to become aware of your brand and come back to you when they are ready to make a purchase decision down the road. What this means is blogs are going to have a high bounce rate and a low average time on site by nature. It’s important to note that nearly 8 out of every 10 visitors who land on any given blog are going to bounce after viewing just one page. You will need to do everything within your power to make a strong first impression and provide intriguing calls to action to keep them engaged and coming back for more. Google Chrome has left all its browser competitors in the dust and is the preferred browser 91 percent of the time. Only 75 percent of websites are actively tracking and quantifying site performance with Google Analytics Goals. 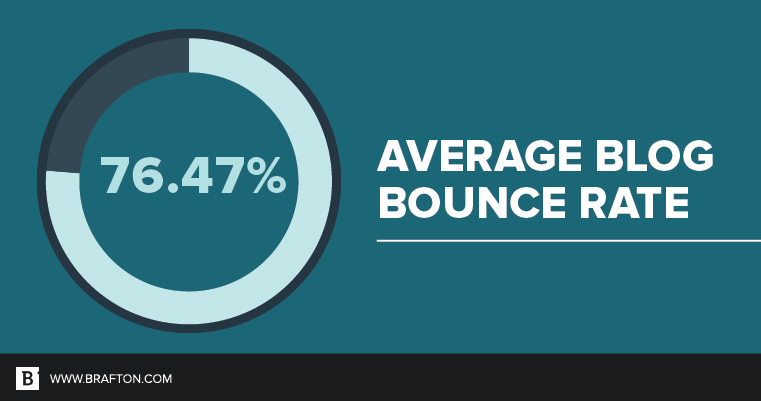 The average bounce rate for all sites surveyed was 58.2 percent. 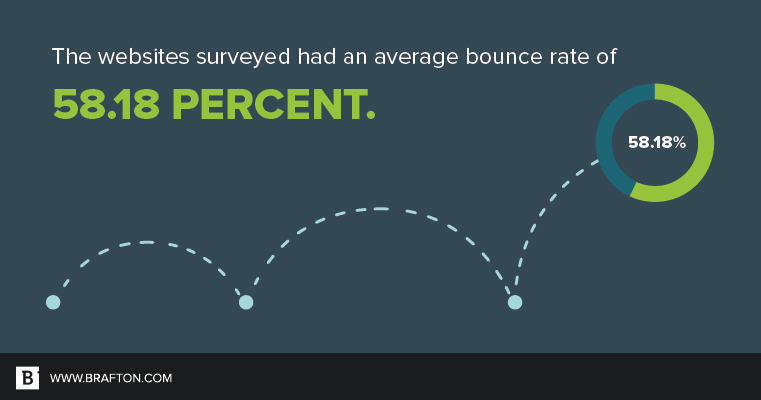 B2B sites bounce at a higher rate than B2C sites with bounce rates of 61 percent and 54 percent, respectively. B2C websites have substantially better time on site performance than B2B, with an average of 2 minutes and 47 seconds on site versus 1 minute and 57 seconds, respectively. B2C sites see 45 percent of traffic coming from a mobile or tablet device versus 22 percent for B2B. 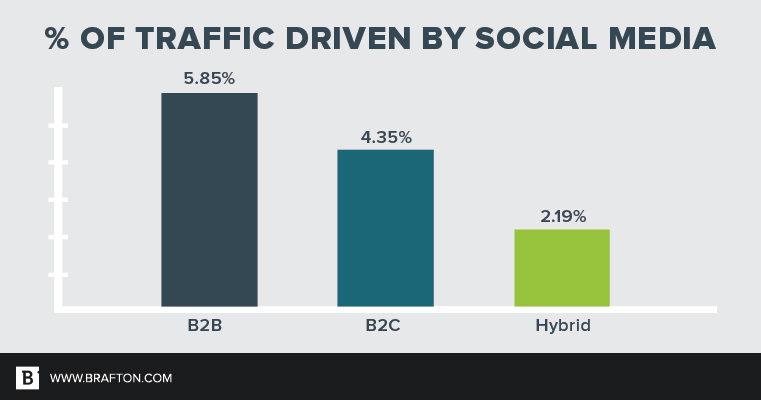 B2B sites drive more traffic via social media (5.85 percent) than B2C (4.35 percent). 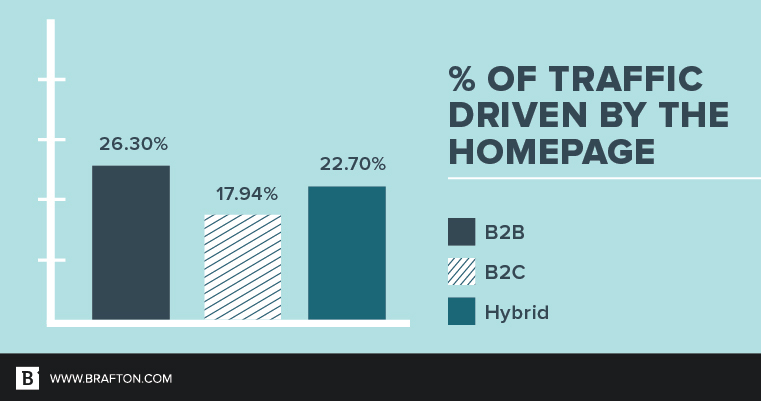 B2B sites are more reliant on the homepage to drive traffic than B2C sites, with 26.3 percent of all traffic being driven by the homepage on B2B sites versus 17.9 percent on B2C sites. 152 sites surveyed generated an average of 27.8 percent more organic traffic from 2015 to 2016. 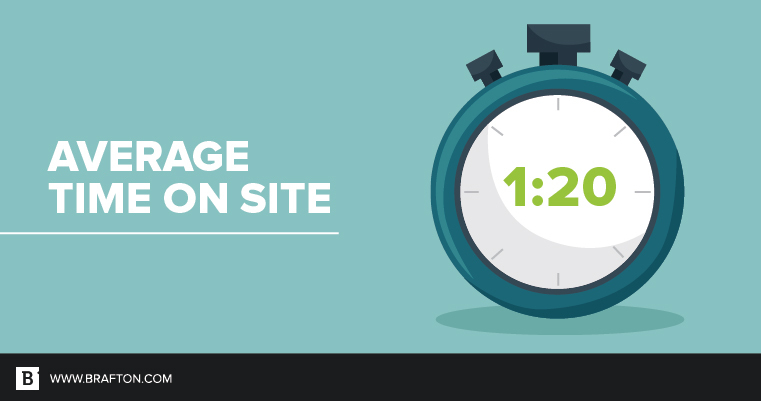 All blogs surveyed had an average bounce rate of 76 percent and an average time on site of 1 minute and 20 seconds.